A puppy weight chart can help you estimate how big that cute little bundle of fur is going to be when full grown. However, it's not one size fits all, its dependent on breed size. So, if you're asking yourself just how big will my pup get? These puppy growth charts should give you a good idea. 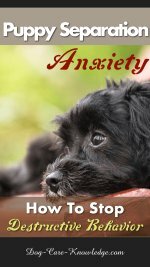 Are you worried that your puppy is growing at an alarming rate? Or do you want to know how big your puppy will get when full grown? 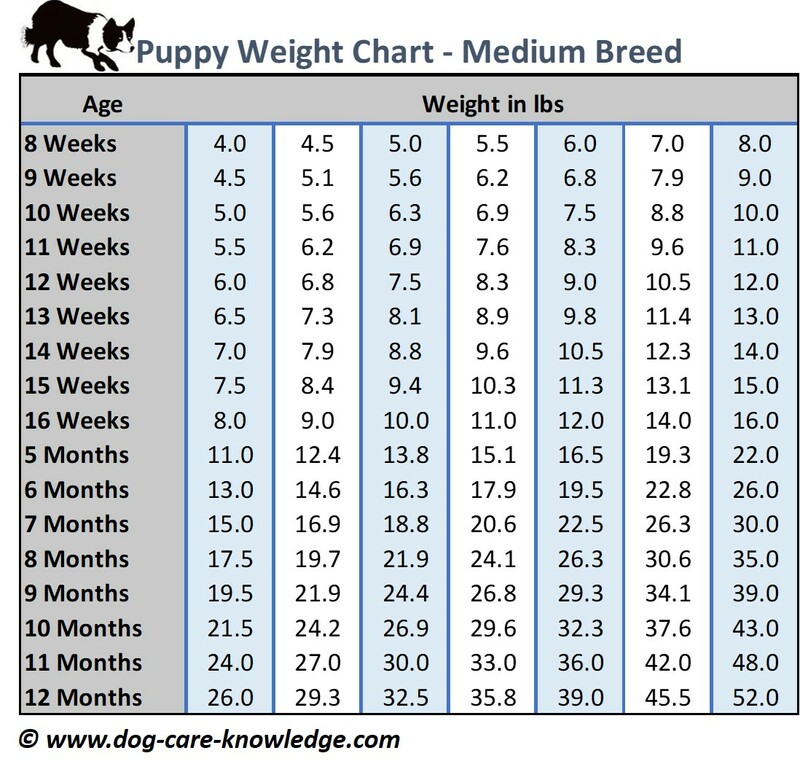 If so, here's a puppy weight chart for each breed size category which should answer the question "how big will my dog get!" You'll also get an idea of how much weight, on average, a puppy gains each week as well as what weight to expect at each milestone. It may seem like time is passing quickly and perhaps she will be much bigger than expected. It’s important to adopt a puppy that fits your lifestyle, size of family, and home. By using these charts as a puppy weight calculator you'll know exactly what to expect as they grow up. If you have a mixed breed dog, then it may feel like you're entirely in the dark with knowing, or even just guessing, how big your adorable mutt is going to be. You could do this two ways. You could take a look at all the growth charts on this page and see where your little guy fits in best. Or if you wanted to be more precise, use a DNA test to see which breeds your puppy is mixed with. Then you'll know which puppy weight chart to use. 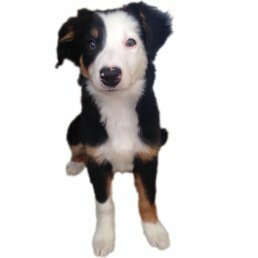 Wisdom Panel is a simple cheek swab test that will determine which breeds your puppy is crossed with and has over 250 breeds, types and varieties of dogs. It can identify purebred ancestors for three generations (great grand-parents) which will give you a good idea of what your adult dog's weight will be AND understand your adult dog's potential behaviors, looks, and health concerns. 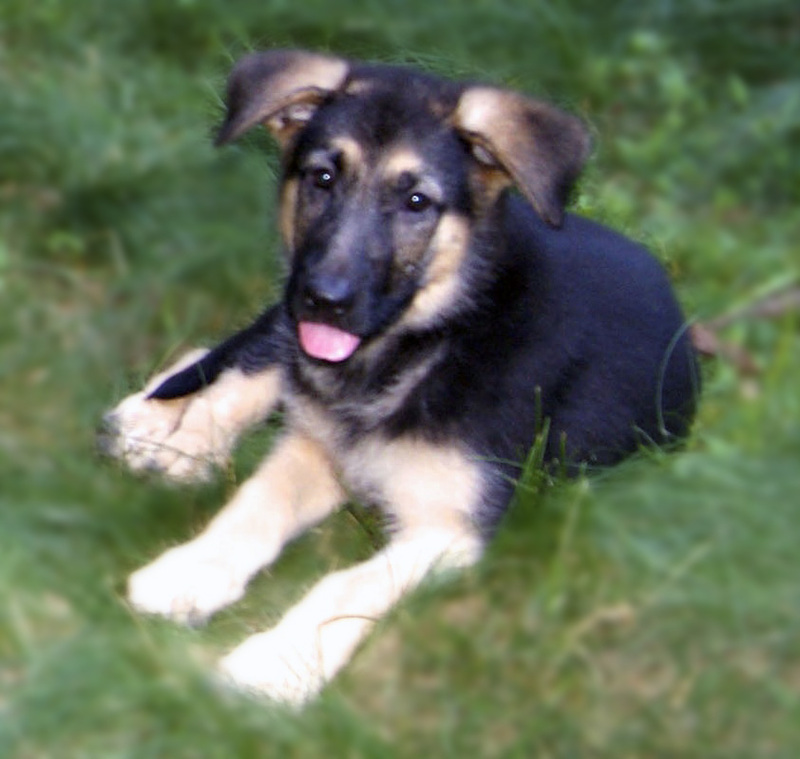 Generally, most puppies fit into one of the five breed sizes; toy, small, medium, large, and giant. However, there is occasionally some overlap between the categories. If you want to document your own puppy's development, then you might want to look at this journal - Puppy's First Year Keepsake Book. Apart from documenting many other milestones, it has a nice chart where you can document your own puppy's growth and weight. Let's start with the little guys out there, the toy breeds. Toy breeds include, but are not limited to, Chihuahua, Chinese Crested, Maltese, Papillon, Pekingese, Pomeranian, Shih Tzu, and Yorkshire Terrier to name a few. Toy breeds on average gain about 5 - 10% of their body weight each day which is roughly between 1 - 5 oz per week. These tiny cuties grow much faster than larger dogs and usually achieve their adult weight by eight or nine months of age. 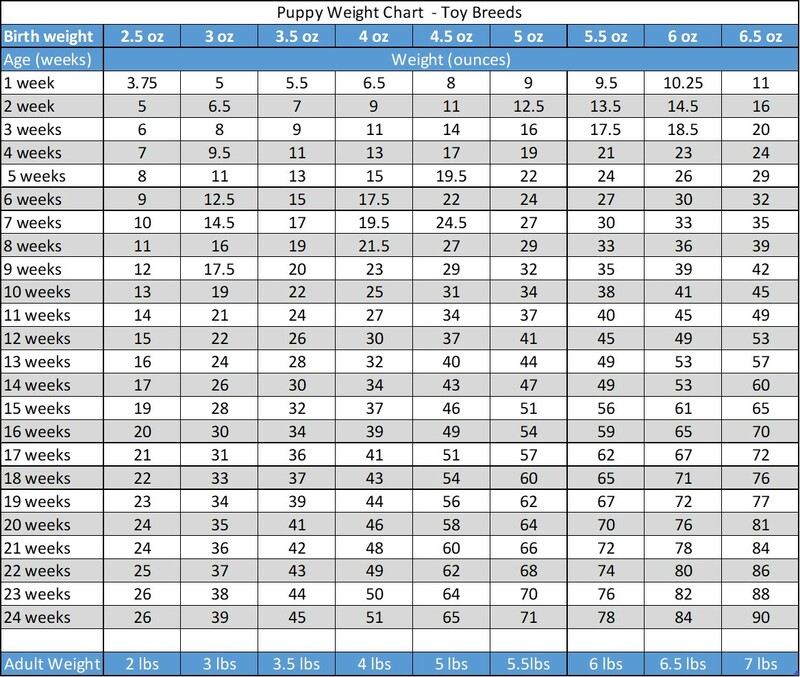 Below is a chart that calculates how big your toy puppy will grow dependent on their birth weight. These tiny cuties grow much faster than larger dogs and usually achieve their adult weight by eight months of age. If you don't know your puppy's birth weight, you'll still be able to calculate his adult weight. Just find his age (down the left column) and find the nearest corresponding weight at that age then go down that column to see what he will weigh as an adult or every milestone along the way. For instance: If you have a 12 week old puppy that weighs 24 ounces (1.5lbs) then the closest to that is between 22 ounces (1.38 lbs) and 26 ounces (1.63 lbs) which means your pup probably weighed between 3 - 3.5 ounces at birth and will weigh between 3 - 3.5 lbs when fully grown. Another way to determine your toy puppy's adult weight is to take his weight at 6-weeks old, double it, then double it again. If you don't know what his weight was at that age (most of us won't), again, use the chart above to find his current age and weight and work back. So, for the same example of the 12-week old puppy that weighs 24 ounces (1.5lb), according to the chart, his 6-week weight was probably between 12.5 and 15 ounces. Double that to between 25 - 30 ounces then double that again to between 50 - 60 ounces. If you want to be a bit more accurate than that, you can find the average of the two, i.e. 50 + 60 divided by 2 = 55 ounces. Then divide that by 16 to get the lbs. So, a 12-week old puppy weighing 1.5 lbs will be about 3.44lbs when grown. If you find that's too much math, well, that's why the charts there! If you're having a few issues with house training your little guy, I can highly recommend this book. 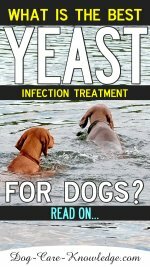 It guarantees you can house train your pup in just 7 days or your money back! How To House Train Any Dog! To get your instant copy of the book, Click Here! Small dogs typically grow faster than a large dog but not as quickly as the toy versions. They reach their adult weight between eight and twelve months. Charles Spaniel, French Bulldog, Jack Russell Terrier, Pug, and Shetland Sheepdog. In general, this consists of breeds that are between 12 and 25 lbs, but there is some overlap with the toy breed size at the lower end of that scale and the medium size dogs at the higher end. 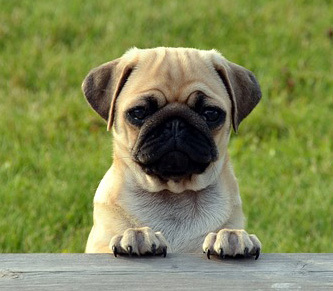 Small breeds tend to gain weight at a rate of 5-10% increase each day which equates to roughly 5-8 ounces per week. You can use this simple chart to determine how big your small puppy will get. 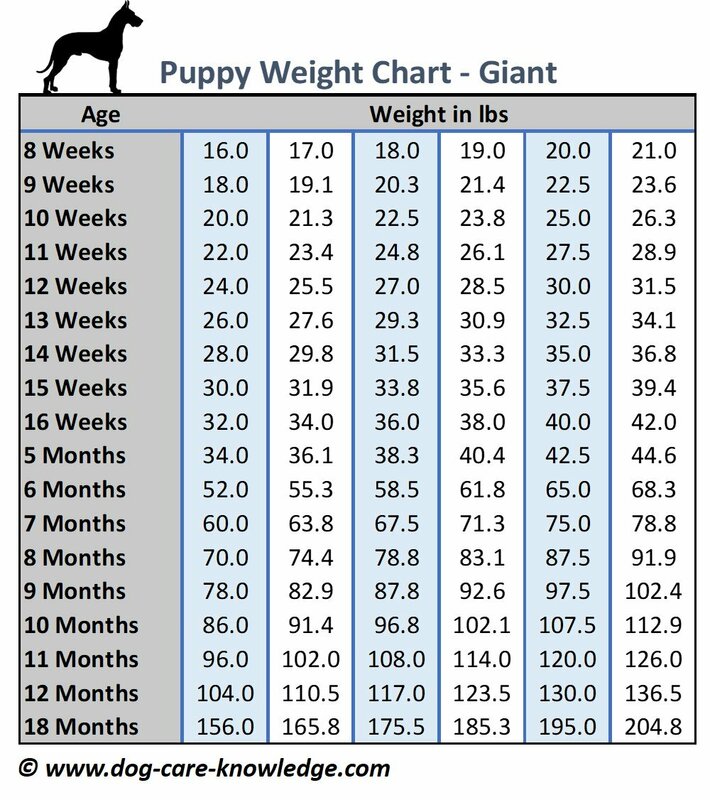 Merely find the weight closest to your puppy's age and go down that column to see the age at 12 months which will likely be his adult weight. For instance, if you have a 16-week old puppy that weighs 5lbs, go down that column where you'll see he/she will be about 16.3 lbs when fully grown. 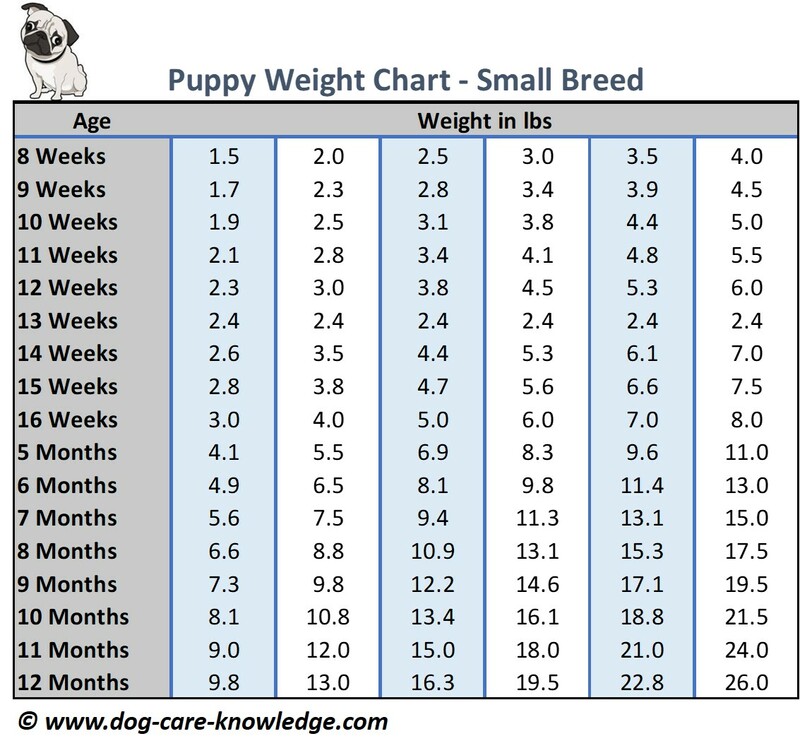 But, what do you do if your puppy's age (or weight) isn't on the chart? Simple answer is to find the average. If your puppy is in-between two weights for his age then you can find the average of the two. E.g. if your puppy is 5.5 lbs at 16 weeks then he will be inbetween 16.3 and 19.5lbs as an adult or, to be more accurate, the average is 16.3 + 19.5 divided by 2 = 17.9 lbs as an adult. Another option to determine his adult weight, if you don't mind a bit of math, is to find your puppy's growth rate and times that by 52. His growth rate is how much weight he gains in one week and is calculated as his current weight divided by his age in weeks. For example, if you have a puppy that weighs 4lbs at 14 weeks old the math would be 4/14 = 0.29 X 52 = 14.86 lbs as his adult weight. Medium dogs typically reach 99% of their adult weight between nine and ten months of age. In general, the medium category consists of breeds that are between 25 and 50 lbs. There is some overlap with the small breed size at the lower end of that scale and the large size dogs at the higher end. Medium breed dogs consist of, but are not limited to; Border Collie, Bulldog, Cocker Spaniel, Corgi, English Springer Spaniel, and Whippet. For a dog that is in the "medium" size category, you can use the below chart to determine how much your puppy will weigh when fully grown. You can also see how much he'll weigh at each milestone, such as 12-weeks,16-weeks, 6-months, 8-months and so on. To use the chart, start with your puppy's age down the left side, then see where he falls based on his current weight. For example, if your pup is 12 weeks old and weighs 7.5 lbs, then follow that column down to the "12-month" row, which in this case is 32.5 lbs, and that'll be how much your pup will likely weigh as an adult. If your puppy's age or weight isn't on the chart, don't worry, there's still a couple of things you can do to calculate his adult weight. If your puppy is between two weights for his age then just find the average of the two. E.g., if your puppy is 7 lbs at 12-weeks he will be between 29.3 and 32.5 lbs as an adult or, to be more accurate, you can find the average which is 29.3 + 32.5 divided by 2 = 30.9 lbs as an adult. If your puppy's age isn't on the chart do this to find his weight at a certain age. If you don't mind a bit of math, there are a couple of other methods to determine your puppy's adult weight. For this method, you'll first need to figure out your puppy's growth rate which is his current weight in lbs divided by his current age in weeks. So for a puppy that weighs 15 lbs at 5-months (22-weeks), his growth rate would be 15/22 = 0.68 To get his adult weight you'd multiply the growth rate by 52, i.e. 0.68 x 52 = 35.36. Based on this method, a puppy that weighs 15lbs at 5-months old would weigh about 35.36 lbs as an adult. You can use this method of calculating the adult weight of your medium breed puppy if you know his weight at 14 weeks. Here's how. For instance: Based on a puppy that weighs 12 lbs at 14 weeks. Large breed dogs take at least a year or eighteen months to reach their full adult weight. In general, the large breed category consists of breeds that are between 50 and 100 lbs, but there is some overlap with the medium breed size at the lower end of that scale and the giant size dogs at the higher end. Large breed dogs consist of, but are not limited to; Alaskan Malamute, Boxer, Bloodhound, Doberman Pinscher, German Shepherd Dog, Golden Retriever, and Labrador Retriever. 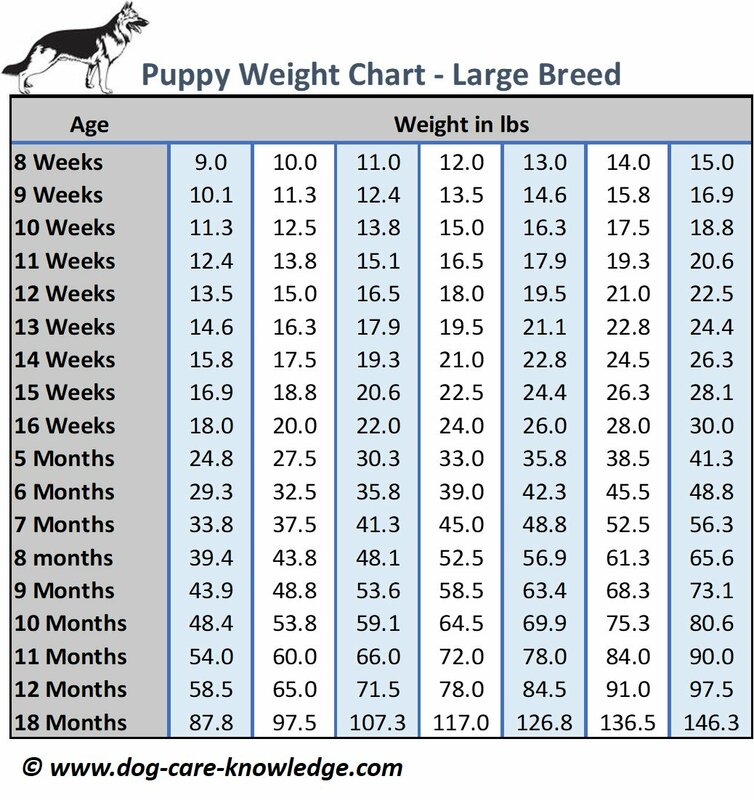 To predict what your large breed puppy will weigh when full grown, you can use the below chart to get a rough idea based on his current weight. To use the chart, start with your puppy's age down the left side, then see where he falls based on his current weight. For example, if your pup is 16 weeks old and weighs 22 lbs, then follow that column down to the "12-month" row, which in this case is 71.5 lbs, which is what he'll weigh if he stops growing then. However, many large breed dogs keep growing past the 12-month point so may continue to keep growing until they are 18 months old so could weigh up to 107.3 if they keep growing until 18 months. If your puppy is in-between two weights for his age, then find the average of the two. Here are a couple of alternative methods to determine your large breed puppy's adult weight. For a large breed puppy, it's best to use this formula based on his weight at 20 weeks (4.6 months) old. You can also calculate the adult weight of a large breed puppy by merely doubling his weight at six months old! So, a dog that weighs 29.3 lbs at 6-months old would weight about 58.6 lbs as an adult. All puppies (and owners) can befit from some structured training. If you'd like hundreds of training videos that you can watch and follow along with at home, I urge you to try Doggy Dan, The Online Dog Trainer. In general, the large breed category consists of breeds that are over 100 lbs, but there is some overlap with the large breed size at the lower end of the scale. Large breed dogs consist of but are not limited to; Bernese Mountain Dog, Bullmastiff, Newfoundland, Saint Bernard, Great Dane, and Irish Wolfhound. Generally, giant breed dogs take longer to reach their adult weight which is at least 12 - 18 months old. Giant breeds that are at the top end of the scale (i.e. Mastiffs, Great Dane's, Newfoundlands, etc), may even continue to grow up to 2 or 3 years old! These giant of dogs typically gain 2 - 3 lbs per week, however, the big guys at the top of the scale (i.e. Newfoundlands) will gain about 3-5lbs per week). To predict what your giant breed puppy will weigh when full grown, use the below chart to get a rough idea based on his current weight. To use, start with your puppy's age down the left side, then see where he falls based on his current weight. For example, if your pup is 10-weeks old and weighs 25 lbs, then follow that column down to the "12-month" row, which in this case is 130 lbs, which is what he'll weigh if he stops growing then. However, many giant breed dogs keep growing past 12 months, so may continue to keep growing until they are 18 months old or even 2-years old. If your puppy is between two weights for his age, then find the average of the two. Agai, there are a couple of formulas you can also use as alternatives to the charts. For a giant breed puppy, it's best to use this formula based on his weight at 20 weeks (4.6 months) old. 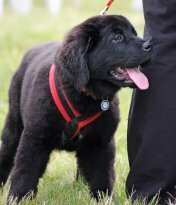 A much simplier method for giant breeds, is to double the weight of your puppy at 6-months old to determine what their adult weight is likely to be. For example, a puppy that weighs 65 lbs at 6-months will likely weigh 130 lbs as an adult. If you're trying to use the chart to find your puppy's adult, but notice he's weight isn't on there, it's easy to find out what he weighed at a certain weight. The easiest way is to look at your vet's record or receipt. We typically take our puppies to the vets between 8 - 16 weeks of age for their puppy shots. Your veterinarian will weigh your pup at that time and keep a record. His recorded weight will be on the receipt, or you can give them a call and ask! 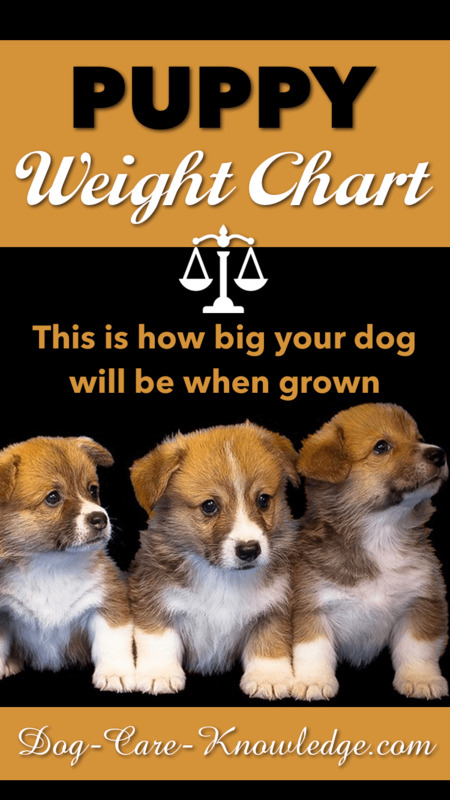 I hope these puppy weight charts, formulas, and puppy weight calculators, help you to understand better how big your puppy will be as a dog. But remember, all formulas and charts are based on average growth rates, but of course, all puppies and dogs grow at different rates. Most of them won't grow at the same consistent rate but will have little growth spurts along the way. Toy and small breeds typically grow faster between birth and 11 weeks and the large and giant breeds have grown faster from birth to 5 months old. Medium size dogs are somewhere in-between the two! It’s very important to feed your dog the right type of dog food to ensure they grow at a normal rate. It's also important to feed your puppy at least three or four times a day to suppport his growing body. Can't remember if you, or other family members fed the puppy? Then you may find this puppy feed organizer useful. It's a simple magnetic tool that you simply 'slide' across when someone has fed the puppy! When calculating food, take into consideration the current size of the puppy and their expected growth spurt to full grown dogs. For instance, you’d feed a toy pup less than a giant pup, as their bones, muscles, and tissues need less energy than that puppy who is growing into a giant breed. Don’t worry too much about small differences in your puppy and the puppy weight chart, as long as they are happy and healthy. The calculators are only a guideline and can’t cover the hundreds of breeds of dogs, or their variations. Some puppies will grow a bit slower, and some will grow a bit faster. Your smaller breeds of dogs will take less time to reach their adult weights, and larger dog breeds will take a longer length of time to grow fully. It will take about 10-months for your small dogs to become adults. Larger dogs can take 1-3 years to grow fully. It can be exciting to imagine how your little pup is going to turn into a significant member of your family. Be sure to take plenty of photographs and videos, to commemorate the process. In later years you can look back and remember when they were cute little pups. 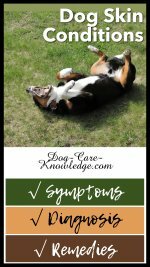 If there seems to be something out of kilter, take your puppy to the vet for a check-up. There are medical conditions that can affect your puppy’s growth—too little or too much. 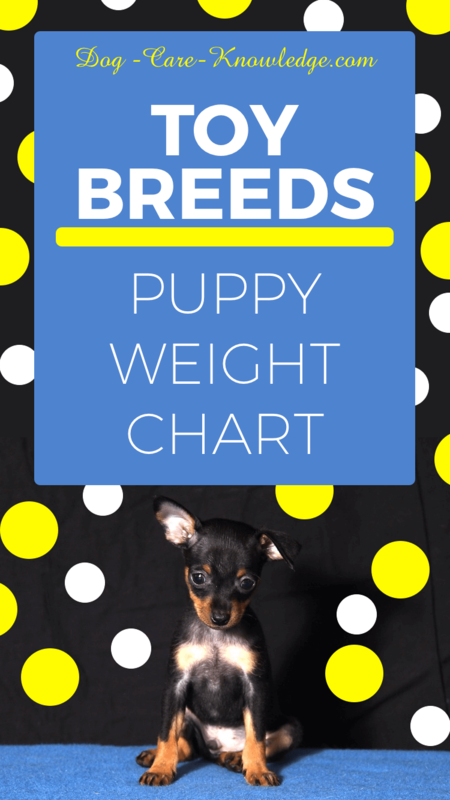 Keep the puppy weight chart handy, so you know what to expect as your pup grows.